There's something about a personalized invitation that ups the game of any event. And whether you're organizing a dinner party, a corporate shindig or the occasion of a lifetime, an online invitation site is an efficient way to keep track of who's coming, let guests know of changes, and of course, send out some sensational invites to your friends and family. Evite.com may have been the groundbreaker in the art of digital party-filling—at 2 billion invitations sent and counting, they're clearly doing something right—but their card designs and platform are starting to look a little old. The best online invite sites today offer stylish, unique designs along with a wealth of event management tools that help you organize your guest list, communicate with attendees, and handle peripheral items like gift registries, ticket sales and donations. In some cases, you can work with the platforms' designers to create unique designs from scratch. Here are our favorites. You can't go wrong with Paperless Post and its collection of sophisticated, classy designs for events from kids' birthdays to anniversary celebrations, weddings and garden parties. 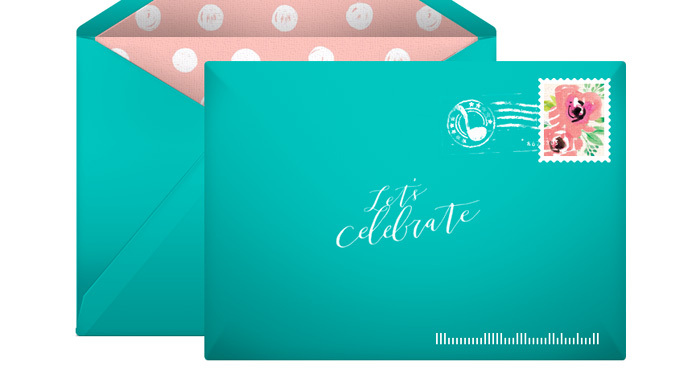 Collaborations with fashion and lifestyle designers such as Oscar de la Renta and Kate Spade New York mean there are plenty of modern, aesthetically pleasing designs to choose for your next batch of invitations, and the fonts on envelopes and card interiors are equally stylish and well-chosen. There are many free designs for online invites, which can include a Google Maps link, a comment wall, a gift registry and poll questions, as well as a request to be added to a mailing list and a plus-one (or more) option for guests to bring partners or kids. For professional events, you can set a maximum capacity that will prevent guests from accepting after a certain limit. All designs can also be ordered as printed invitations, with envelopes addressed and proofed for free, mailed to your home (you do your own mailing). 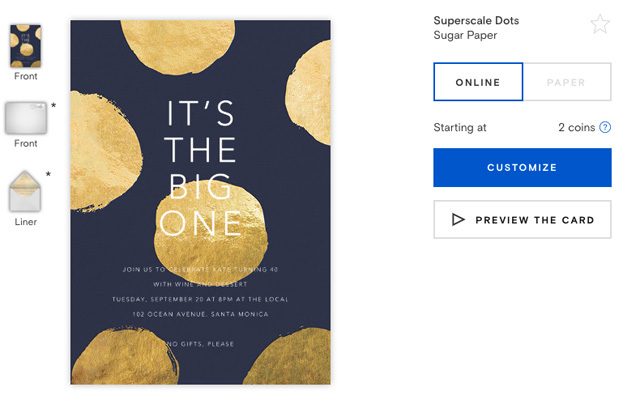 But: Cost per invite can add up when you're using premium designs for printed invitations. Custom designs: No, but you can upload your own design or photos. If you enjoy dressing up casual events with cute, personalized invitations, Pingg might be for you. Its low-key, cheerful designs, created by independent artists, are organized by category, including BBQs, pool parties and birthdays. 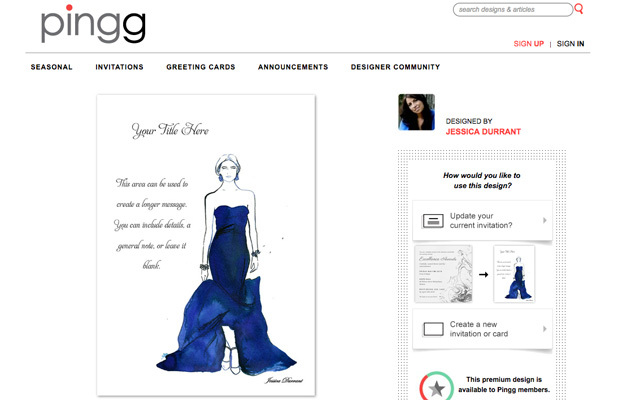 You can also upload your own designs or photos to use in the invites. If you're planning a potluck, you can add a list of food items that guests can then sign up to bring. You can also add a gift registry for birthdays or weddings. If there's a third-party event or other venue involved—or if you'd like to collect cash for a joint gift—Pingg lets you sell tickets and collect donations. The free service displays ads on the invites, which might not be an issue if you're inviting your girlfriends to the monthly movie night; otherwise, you can pay $10 per event (which includes access to a premium design) or $30/year for unlimited events. Love it: You can set automatic reminders to be sent to guests to RSVP. But: Invitation designs may be a little informal for special occasions such as a wedding. Custom designs: No, although you can upload your own designs or photos. Since we last checked out Punchbowl, this functionality-first online invite service seemingly focused on helping people organize potlucks has had a style revamp. Its invitation options include hand-painted and pencil-drawn designs and more minimal prints, and—excitingly, for anyone organizing a kid's birthday­—cartoon character cards featuring Hello Kitty, Spider Man and Elsa from Frozen, to name a few. 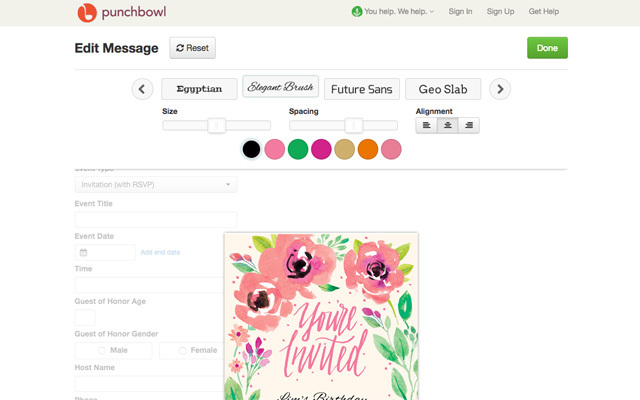 You can change the font of editable text as well as its color (your choices are limited, cleverly, to a palette of complementary shades), and tweak the envelope's lining, postage stamp and rubber stamp. The back-end system is packed with features—you can arrange guests in family groups (handy when the guest list include kids who won't RSVP) and set automatic reminders for RSVPs, as well as communicate with guests via the platform. With a paid-for membership (from $4.99/month), you can create recurring events and poll your guests (or their parents). Love it: If you want to shrink your carbon footprint, Punchbowl will donate a part of the proceeds from certain designs to reduce paper production. But: The details section of invitations aren't as sleekly designed as the "front." Custom designs: No, although some designs allow you to upload your own photos. If you're a firm believer in the etiquette of thoughtful handwritten invitations, Greenvelope is should be your first stop. Its hundreds of designs span moody watercolors, quirky hand-drawings, elegant minimalist images and more classic romance illustrations, many with templates for a suite of save-the-dates, invitations and post-event thank-yous. There's a comprehensive, easy-to-navigate dashboard where you can set up RSVP tracking and customize your invites with survey questions (useful if you're doing a professional event), a gift registry, ticket-selling features or donations. There are tons of features especially suited to weddings and big events, with options for guests to enter names of plus-ones (or more), the ability to address invites by group (for example, family or couple), and a summary of open rates and responses. The platform also caters well to multi-event agendas—there's a dedicated section to add each event and its venue with a description, time and Google Maps link, all of which are included in the details section of the invite itself. However, guests can't respond separately to each event. So if someone could attend the wedding but couldn’t make it to the rehearsal dinner, there’s no good way to let the host know. Greenvelope donates part of every sale to Mountains to Sound, a nonprofit organization that maintains forests. But: Preset fonts inside the cards can be bland, especially compared to the stylish external fonts. Custom designs: An in-house designer can customize or create a new design from scratch. Mainly intended for weddings, Minted's designs are sourced from a diverse community of independent artists and printed on luxurious cotton paper. You can pick a card design only, or go for the free wedding website as well, where you can post the details of the big day (or long weekend), track your RSVPs for separate events, and add a gift registry. The website designs are all from artists who've won competitions organized by Minted. 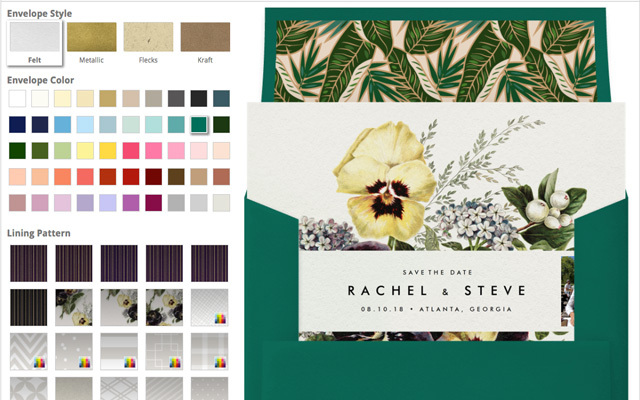 Choose your favorite look and customize it with your wedding details, and then you can (if you want to) order the matching printed invites, which include addressed guest envelopes (you do your own stamping and mailing). 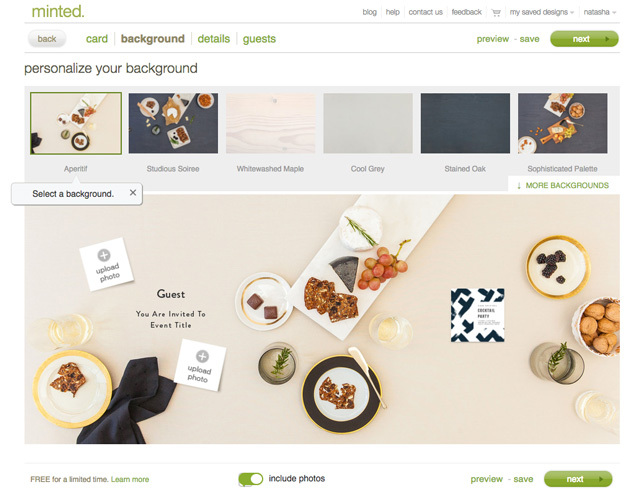 Minted recently launched its online invite feature in beta, where you can create free online invitations for other occasions—dinner parties, bachelorette bashes, holiday parties. Guests are treated to a sleek, scrolling, animated invite when they click on the link. Along with the event details, hosts can include a Google Maps link, survey question, and an option for guests to bring a plus-one (or more). As with the e-vite heavyweights, you can set RSVP reminders and event reminders to be sent automatically. But: Wedding invitations are print-only and guests can only RSVP online if you've created a wedding website. Custom designs: You can work with a designer to amend designs or create new ones (print invitations only). Ability to track RSVPs: Yes—but wedding invites can only be tracked if you use the wedding website. For longer text I am also using http://www.text-invite.com/ to find inspiration. The text quality is very good and it is free on-line content related to party’s invitations. The service is simple and works well on desktops and mobiles. Although it has not many features but does its job quite well, and most important - it does not require registration. Phildora, which is pretty cool. I used it to host a part at my place and it was pretty easy esp that it is all mobile and I can send invitations directly to my phone contacts. and theyccall these invites as pvites.. haha. I want to send one invitation to a large list of people offering them the option to attend on of two gatherings. I’d like there to be an option: click this to accept option A and click this to accept option B. Then I’d like rsvps to be tracked by option accepted. Do you know of a site offering this functionality? Did you ever find a program/website that would be able to do this? It’s exactly what I’m looking for as well! Does Carda.co have ecards as well as printed ones? This list is pretty good - I’ve used Paperless Post in the past. As another suggestion: I recently stumbled across RSVPify ( https://rsvpify.com/ ) for planning some of the own parties/meetings. The one complaint I have is that they only offer 100 free RSVPs… but the plans are relatively cheap, so I ended up picking up a subscription. I’d say they’re worth a look. This list is very useful. This list is very useful. Thanks for sharing! I would like to introduce a new tool Inviter(https://inviter.com/) - it is a video invitation & video greetings tool. You can create & send video invitations easily & track your guests RSVP’s also. I am looking to send e-invitations for a birthday weekend. Lots of family will come into town, so there will be multiple events through the weekend. Any ideas on best web invitation/tracker? You can easily track your guests RSVP details with video invitation & you can also send reminders to them.If you want more details please ping a message to me. Can some one help me with any email initaion site, like toluna email invitaion? https://www.AllmyNeeds.com is releasing a killer app for guest list and invites, along with a super guest registry. I previewed it in beta and it is cool. I think it opens to the public in mid August 2016. These guys are a hub for all services, including wedding DJs, photographers. My daughter found her babysitter there. Thank you, this post was very helpful and introduced me to several new sites I didn’t know about. We are looking for a list keeper of something that is being planned by one set of grandkids for Christmas to invite 40 people and have them bring specific needed items from 2 lists (say list a and list b). This way individuals can be instructed to choose any one item, and families can be instructed to bring an item from each column. Young grandkids are putting this together so they don’t have a readily available budget. Adult supervision will be given. Do you have some easy free sites you can suggest? I love creating printable items for all occasions. Fall and Christmas are topping my list of items right now with it being November. I do charge for my items, they are all custom high quality digital files that can be printed, e-mailed or used on social media. Printables from invites, announcments, photo cards, picture collages, banners, any size or styles, from small to very large. For personal or business items, I create everything. Invites and Delites is the name of my shop and can be found at http://www.InvitesAndDelites.com . Turn around time is quite quick for custom work. http://www.countus.in is another great option. Compared to evite (which is what I have used mostly in the past) - it gives you a single link shareable anywhere as an invitation and has single click sharing integration with WhatsApp, SMS and Email (no need to import contacts). I personally like sharing over WhatsApp or SMS since the response rates are faster / higher. Creating an invite is also fairly quick - takes me less than a minute since it’s one form with 4 or 5 fields. Does anyone know of a good site to use to send invitations when you want to personalize how many people you want to invite per email address? For instance, I want to invite 4 people in one family and only 2 people in another family. Is there any sites that allow for this customization? I don’t have email addresses for every member of each family so I can’t send them individually. Another good online invite option is Sendomatic http://www.sendomatic.com. Good for personal or business events - they have a free option and invites can also be sent by text message. You can also try https://www.justrsvp.me. It’s quick to set up, and lets you limit +1s that will be attending with the invited guest. Where is the tracking on multiple events? Anyone find a service that allows people to accept/decline certain parts of the invite? Yes I will go to the park but no I won’t go to the dance party…something like that? We are helping to put on a Celebration Of Life Service for a very popular Lawyer in our town. We do not have E-Mail addresses to send the invitation to. In fact, we really don’t want to send an invitation. Is there a website that does not require the RSVPer to download an App? We would include the URL on all our correspondence and hope that people would sign in and let us know they are coming. The idea is to get some kind of count of how many people are planning on attending. there is an app called phildora. It has such cool gif based invitation templates and amazing features. Your guests need not download the app to rsvp. They receive an SMS with the invitation link. I have used Pingg several times in the past with no problem. Unfortunately, they botched a recent invite (not possible to RSVP) and have no ETA for fixing it. There is no phone or chat support so good luck trying to get in touch with someone. This might be my last time using them. I was really disappointed that Greenvelope charges almost $1 per evite. If you want to add charging features it can really add up for your guests with the combined %1 for Greenvelope and stripe processing fee 2.9 %+ 30 cents. Would have been useful information for this blog. Scale of party will determine the number of chairs, tables and cutlery required. But when it comes to arranging all these you need quality supplies well in advance. They can provide you generator and vending machines like popcorn machines etc. that make your guests smile. Hire reputed party rentals Sacramento to enjoy peace of mind throughout the party. May we suggest STUFF. A simple platform for public and private invitations. Integrates nicely into you preferred calendar tool.